The European Commission has decided that Luxembourg and the Netherlands have granted selective tax advantages to Fiat Finance and Trade and Starbucks, respectively. These are illegal under EU state aid rules. Commissioner Margrethe Vestager, in charge of competition policy, stated: "Tax rulings that artificially reduce a company's tax burden are not in line with EU state aid rules. They are illegal. I hope that, with today's decisions, this message will be heard by Member State governments and companies alike. All companies, big or small, multinational or not, should pay their fair share of tax." 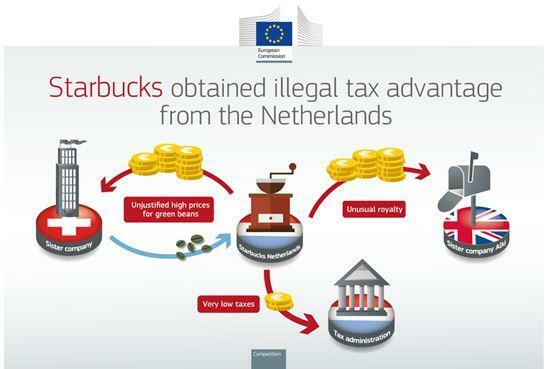 Following in-depth investigations, which were launched in June 2014, the Commission has concluded that Luxembourg has granted selective tax advantages to Fiat's financing company and the Netherlands to Starbucks' coffee roasting company. In each case, a tax ruling issued by the respective national tax authority artificially lowered the tax paid by the company. Tax rulings as such are perfectly legal. They are comfort letters issued by tax authorities to give a company clarity on how its corporate tax will be calculated or on the use of special tax provisions. However, the two tax rulings under investigation endorsed artificial and complex methods to establish taxable profits for the companies. They do not reflect economic reality. This is done, in particular, by setting prices for goods and services sold between companies of the Fiat and Starbucks groups (so-called "transfer prices") that do not correspond to market conditions. As a result, most of the profits of Starbucks' coffee roasting company are shifted abroad, where they are also not taxed, and Fiat's financing company only paid taxes on underestimated profits. Therefore, the Commission has ordered Luxembourg and the Netherlands to recover the unpaid tax from Fiat and Starbucks, respectively, in order to remove the unfair competitive advantage they have enjoyed and to restore equal treatment with other companies in similar situations. The amounts to recover are €20 - €30 million for each company. It also means that the companies can no longer continue to benefit from the advantageous tax treatment granted by these tax rulings. Furthermore, the Commission continues to pursue its inquiry into tax rulings practices in all EU Member States. It cannot prejudge the opening of additional formal investigations into tax rulings if it has indications that EU state aid rules are not being complied with. Its existing formal investigations into tax rulings in Belgium, Ireland and Luxembourg are ongoing. Each of the cases is assessed on its merits and today's decisions do not prejudge the outcome of the Commission's ongoing probes. The Commission's investigation showed that a tax ruling issued by the Luxembourg authorities in 2012 gave a selective advantage to Fiat Finance and Trade, which has unduly reduced its tax burden since 2012 by €20 - €30 million. Due to a number of economically unjustifiable assumptions and down-ward adjustments, the capital base approximated by the tax ruling is much lower thanthe company's actual capital. As a result, Fiat Finance and Trade has only paid taxes on a small portion of its actual accounting capital at a very low remuneration. As a matter of principle, if the taxable profits are calculated based on capital, the level of capitalisation in the company has to be adequate compared to financial industry standards. Additionally, the remuneration applied has to correspond to market conditions. The Commission's assessment showed that in the case of Fiat Finance and Trade, if the estimations of capital and remuneration applied had corresponded to market conditions, the taxable profits declared in Luxembourg would have been 20 times higher. Starbucks Manufacturing EMEA BV ("Starbucks Manufacturing"), based in the Netherlands, is the only coffee roasting company in the Starbucks group in Europe. It sells and distributes roasted coffee and coffee-related products (e.g. cups, packaged food, pastries) to Starbucks outlets in Europe, the Middle East and Africa. The Commission's investigation established that the royalty paid by Starbucks Manufacturing to Alki cannot be justified as it does not adequately reflect market value. In fact, only Starbucks Manufacturing is required to pay for using this know-how – no other Starbucks group company nor independent roasters to which roasting is outsourced are required to pay a royalty for using the same know-how in essentially the same situation. In the case of Starbucks Manufacturing, however, the existence and level of the royalty means that a large part of its taxable profits are unduly shifted to Alki, which is neither liable to pay corporate tax in the UK, nor in the Netherlands. Furthermore, the investigation revealed that Starbucks Manufacturing's tax base is also unduly reduced by the highly inflated price it pays for green coffee beans to a Swiss company, Starbucks Coffee Trading SARL. In fact, the margin on the beans has more than tripled since 2011. Due to this high key cost factor in coffee roasting, Starbucks Manufacturing's coffee roasting activities alone would not actually generate sufficient profits to pay the royalty for coffee-roasting know-how to Alki. The royalty therefore mainly shifts to Alki profits generated from sales of other products sold to the Starbucks outlets, such as tea, pastries and cups, which represent most of the turnover of Starbucks Manufacturing. As a matter of principle, EU state aid rules require that incompatible state aid is recovered in order to reduce the distortion of competition created by the aid. In its two decisions the Commission has set out the methodology to calculate the value of the undue competitive advantage enjoyed by Fiat and Starbucks, i.e. the difference between what the company paid and what it would have paid without the tax ruling. This amount is €20 - €30 million for each of Fiat and Starbucks but the precise amounts of tax to be recovered must now be determined by the Luxembourg and Dutch tax authorities on the basis of the methodology established in the Commission decisions. The fight against tax evasion and tax fraud is one of the top priorities of this Commission. In June 2015, the Commission unveiled a series of initiatives to tackle tax avoidance, secure sustainable tax revenues and strengthen the Single Market for businesses. The proposed measures, part of the Commission’s Action Plan for fair and effective taxation, aim to significantly improve the corporate tax environment in the EU, making it fairer, more efficient and more growth-friendly. Key actions included a framework to ensure effective taxation where profits are generated and a strategy to re-launch the Common Consolidated Corporate Tax Base (CCCTB) for which a fresh proposal is expected in the course of 2016. The Tax Transparency Package presented by the Commission in March also had its first success in October 2015 when Member States reached a political agreement on an automatic exchange of information on tax rulings following only seven months of negotiations. This legislation will contribute to bringing about a much greater degree of transparency and will act as a deterrent from using tax rulings as an instrument for tax abuse - good news for businesses and for consumers who will continue to benefit from this very useful tax practice but under very strict scrutiny in order to ensure a framework for fair tax competition.